James2001 wrote: Dear friends, what a wonderful night. Apologies in advance for the low quality video. But here is 'Tower of Song'. I have some photos that I will share when I can work out how and make the time. And thanks to Jarkko for this forum. Thank you James!! Your video is terrific. So glad you captured this! sue7 wrote: Bird on a Wire: a gorgeous, bluesy version, with wonderful guitar by Mitch Watkins: different than Bob Metzger's amazing arrangement: impossible to choose one which is better. Leonard sang this as though he had just discovered it yesterday, as though it was the most urgent and important thing in the world at that moment. That he could allow me to hear this song, a song that I have known for more than 40 years, as a new revelation, was a real gift. Can't wait for tomorrow evening in Brooklyn! Had Montreal not been on the list for concerts I would have went to MSG but no regrets on my decision to see Leonard in his home town. Thanks for the wonderful review of all the concert and enjoy Brooklyn. sturgess66, thanks for the videos and your review too, hope you've had some rest! sturgess66 wrote: I'm back home from the Big Apple and tired, but what a beautiful show it was last night at The Garden! I was whelmed over - again and again and again. Thank you for your wonderful concert report Linda. It's lovely to hear from you at first hand. Last night, 20,000 of us in the audience sat mesmerized, collectively holding our breath as Leonard Cohen, performing his Old Ideas World Tour 2012, sang "Bird on the Wire" at Madison Square Garden. Except for Cohen's low gravely voice, the Garden was so silent you could have heard a finger slide across an iPhone. He was the preacher, the stage was his altar and the venue was his cathedral. The backdrop was a wall of silk curtains which rose from the floor to the rafters and changed colors with each song. The sound system was so perfect you could hear each syllable and chord from everywhere in the Garden. Cohen, a Canadian, moved to America in 1967, hoping to become a folk music singer-songwriter and hung around Andy Warhol's Factory. Cohen's song "Suzanne" became a hit for Judy Collins. When he put out his first album, Songs of Leonard Cohen, it was a cult favorite in both Great Britain and the U.S. and stayed on the charts for a year. 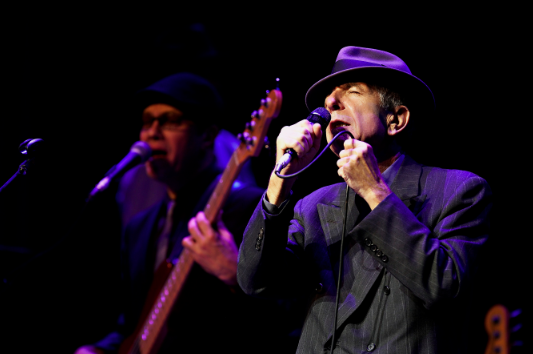 Two years later, Cohen released his second album, Songs from a Room, including "Bird on a Wire," produced by Bob Johnston. After the 1990's, Cohen's track "Everybody Knows," co-written by Sharon Robinson (who also sang back-up and a solo last night) was featured in the film Pump Up the Volume, and suddenly he had an entire young audience as fans. His popularity continued among the young after Natural Born Killers featured three of his songs: "Waiting for the Miracle," "The Future" and "Anthem." In 1994, Cohen went into retreat at the Mt. Baldy Zen Center in California where he stayed five years and was ordained a Buddhist monk. I figured that was the end of his musical career, but was thrilled that in 2001 he released Ten New Songs, co-composed with Sharon Robinson. The album was a hit, especially the single "In My Secret Life." Sadly, in 2004, Cohen discovered that his longtime close friend and business manager, Kelley Lynch, was stealing money from him (and had been since 1996). Cohen sued and a Los Angeles County superior court awarded him $9 million. Lynch ignored the suit and didn't respond to a subpoena. Last March, Kelley Lynch was arrested in Los Angeles for violating a permanent protective order that forbade her from contacting Leonard Cohen. She was found guilty and sentenced to eighteen months in prison and five years probation. Cohen told the court, "It gives me no pleasure to see my one-time friend shackled to a chair in a court of law, her considerable gifts bent to the services of darkness and deceit. It is my prayer that Ms. Lynch will take refuge in the wisdom of her religion, that a spirit of understanding will convert her heart from hatred to remorse." Leonard Cohen's compassion could be felt in every song last night -- from "Everybody Knows, Darkness" and "Anthem" to "I'm Your Man, Democracy," and "Suzanne." He also had the generosity to introduce every band member -- each a virtuoso, including Sharon Robinson and The Webb Sisters on background vocals, Neil Larsen on keyboards & Hammond B3 accordion, Mitch Watkins on guitar, Javier Mas on bandurria, laud, archilaud, and12-string acoustic guitar, Rafael Gayol on drums and percussion, and Alexandru Bublitchi (violin). Early in the evening, Leonard Cohen adjusted the angle on his fedora, looked out at the audience and said, "I don't know when we'll meet again, but tonight I promise I'll give you everything I've got." And he did, including an encore of six more songs. I was there. One of the finest concerts I have ever seen. Truly unforgettable. Maybe even sublime. The musicians were great...a deeply moving experience. Thanks for the great review. I was at this show and there were too many highlights to mention but a few that come to mind - Everybody Knows, Democracy and a surprisingly moving Darkness from his latest album. When he turned A Thousand Kisses Deep into a spoken word performance it was cool to realize that a guy who started as a poet was basically reciting poetry to 20,000 people at Madison Square Garden - and it worked. That alone is quite an accomplishment. Leonard went onstage at either 8:10 or 815. I forgot to look at my watch to get the exact time. But he left the stage at 11:45. He gave us a three and a half hour show and every minute was a highlight. I saw him in Boston and he was amazing. He did A Thousand Kisses Deep here, too. He's so obviously from that spoken word poetry tradition in the 60s and 70s, he's just the best one, the one that lasted whether it was in fashion or not. The intimate setting at the Wang Theatre was great, but I wish I could have seen him just talk to a packed MSG audience. I've seen Mr. Cohen about a dozen times since the late 70s and been mesmerized by every performance Famous Blue Raincoat,I'm your Man,Everybody Knows,Sisters of Mercy and of course Suzanne are all pure poetry and the list goes on.I'm suprised though even fans of his who are familar with his poetry writings rarely know he published a novel titled Beautiful Losers which the crictic Richard Ellmann called a minor classic. Saw Leonard inTampa a few years back. Flying from Tampa to New York Tomorrow to catch him in Brooklyn. One of the finest shows I've ever seen, for me it's so spiritual:) Can't Wait. Thank you, thank you for your fine review. It is truly a transcendent experiece to receive the gift of a Leonard Cohen concert with such a richly talented cast. He has only grown better with age - up there in the Tower of Song. We are blessed to live in this time with him. All good things. Yes we certainly are. There is no greater poet/singer than Leonard Cohen. And how lucky we are to have seen him! I hope there is good video of "Amen." Mabeanie1 wrote: Thank you for your wonderful concert report Linda. It's lovely to hear from you at first hand. I agree - thank you Linda! And thank you - I would LOVE to be "first hand" more often. This "albertnoonan" guy? We know who he is. It was a great experience. Thanks, again, Jarkko, for arranging the fan tickets. Going to Barclay Center tonight. Ready for another awesome time. Taking my daughters; only one has seen him live and that was many, many years ago. Raising an imaginary glass of champagne to many more years and many more tours! Agree - great video so no need to apologise .Really important that you captured this ! it's a precious historical document ! Thanks Hartmut, sturgess66 and cohenadmirer for the very kind words. I'm not used to the whole pocket filming thang. Here is a link to my photos from the night. I use a fixed focal length lens and was seated, so I had to do a little cropping. I also did a little post processing here and there. Just a few minutes. The shots are not as good as many I have seen from the night, many that have been posted here for example. But still, a different perspective and some nice atmosphere in some. I am happy for friends on this forum to view, but please be respectful with any shares, links or reposting. If in doubt, please ask. I was impressed with MSG friendly attitude to cameras. Although personally always irritated to see banks of tiny screens shining back at me from phones etc But rare to get so little hassle in a major venue. I cannot add anything to improve on the feedback and comments about the show above. My wife and I travelled up from DC for the show (18 hour round trip) and it was worth every effort. Aside from the performance and poetry of the evening I'd like to highlight Leonards generosity and professionalism in recognising his tour team for their work. The personal name checking of the technicians was a nice touch and not at all mawkish. I've had the pleasure of seeing Leonard in London 85 (the first time can always be special, right) and 87. Montreal 2008 (two nights). Maybe one or two others. Been listening and reading since approx 1980. Cheers for now. Happy Festivus. From Getty Images - I believe this picture is from the end of the show - after "Closing Time" Leonard made some closing remarks and gave his blessings and then said "good night dear friends, good night, good night, good night." He took off his hat and gestured to his band, laid down the microphone and bowed, and skipped off stage. But he stopped at the far side of the stage, looked at the crowd, raised his hat, and then put is hand on his heart. Copyright © 2012 Getty Images. All rights reserved.